I am currently taking Kate's online mini-class about watercolor pencils. I bought a selection of Faber-Castell Albrecht Durer open stock pencils many years ago and use them periodically - by trial and error. They are wonderful for me to carry around as a limited palette, with a waterbrush, because I can use them anywhere - even in museums. 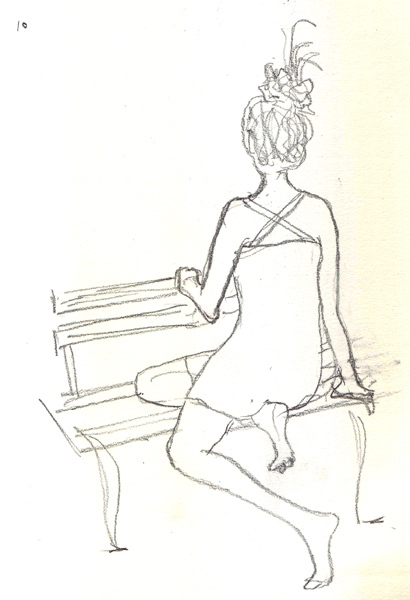 I also draw with a watercolor pencil on longer poses at figure drawing and then wet the pencil for shading. But I knew that Kate's class would be a valuable experience - and being able to sign up for it at any time makes it available to all of her fans! 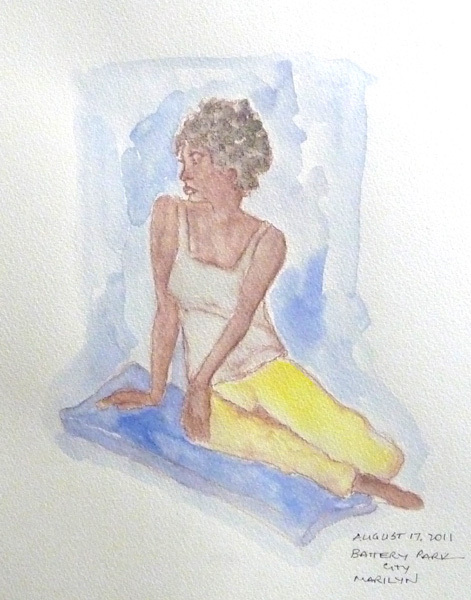 I worked through the exercises in Lessons 1 and 2 so far, really testing my tools - as she calls it. 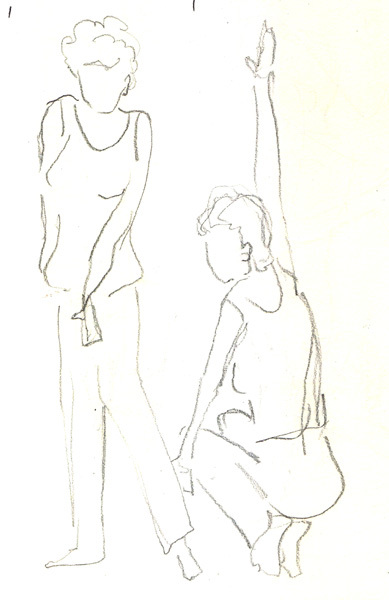 I'm posting two of the small drawings that were part of lots of testing. 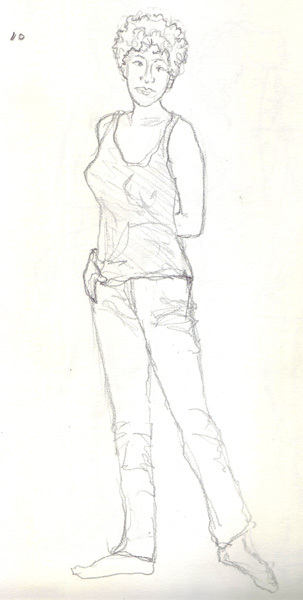 In the first, I drew a small scene from one of my recent photographs with colored pencils. Then I wet them and added a little ink. 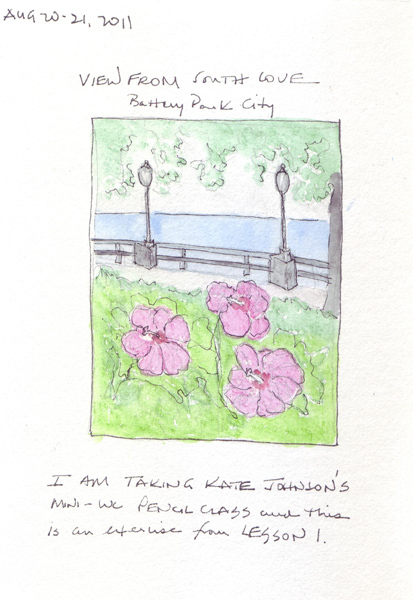 These are giant habiscus flowers along the Hudson River embankment in Battery Park City. 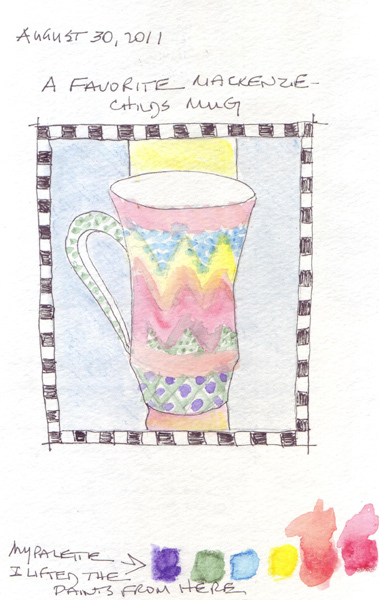 On the second page, I created blocks of color from the pencils directly on my paper - even blending two pencils to create color, This was my palette to paint a drawing that I did of a favorite mug. I love this technique, and was happy that I could even add a few more "dots" with the pencil after it was dry. My husband, 3 children and their spouses, and our 6 grandchildren were supposed to meet at the beach this weekend to end the summer. Needless to say, that didn't happen. We were packed and ready to leave on Thursday when we all decided that we would be better off in Manhattan and DC than on the tip of Long Island if Irene continued on the projected path. 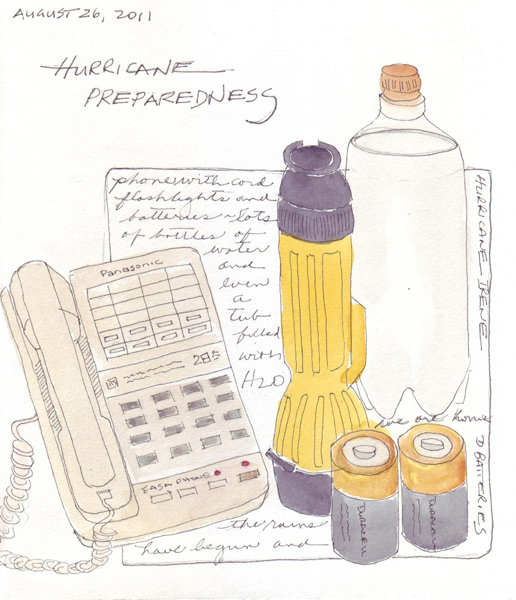 My husband and I prepared: flashlights, batteries, the old plug-in phone that doesn't require electricity and bottles of water for the refirgerator. In addition we had buckets of water and a bath tub full of water to flush toilets. The pumps that are required for water pressure/flow in apartment buildings also stop working when the power goes out. Here is my sketchbook page to remember the preparations. 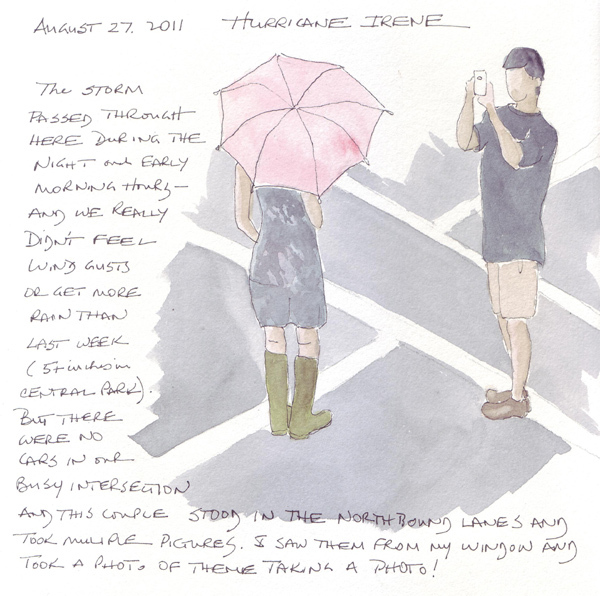 Yesterday I was really bored, but also a little unsettled, as we waited for the hurricane to arrive. We had intermittent heavy rain until we went to bed - and this morning were surprised that 1). we weren't awakened by howling winds and 2) the winds were still rather gentle and it was one hour before landfall here in Manhattan when we woke up. Other areas were not as lucky - there was tremendous flooding inland and hundreds of thousands who lost power. By 11 AM, the rain had almost stopped and life was returning to the streets. I had my camera in hand when this young couple stopped in the middle of a usually busy intersection and took multiple photos - standing right in the middle of the uptown lanes. So I took a photo of them from my window - loving the big pink umbrella! 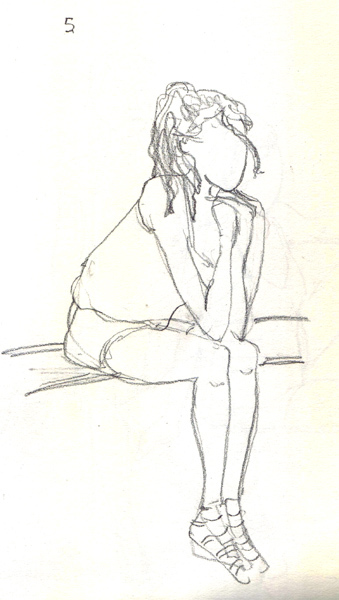 Here are a few sketches from this week's Figure Drawing in Battery Park City - on the tip of Manhattan. 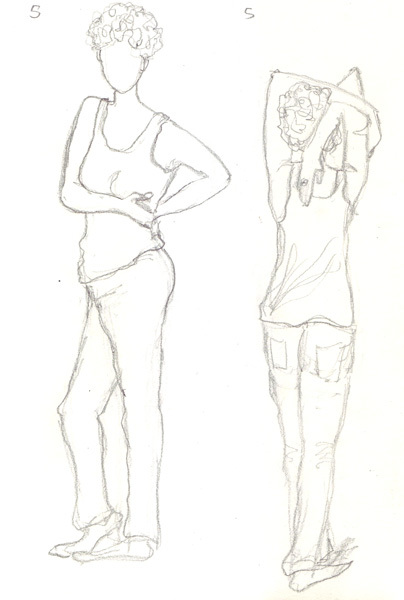 I struggled with some of the sketches, but I'm not going to blame the model! We sketch in a beautiful area right along the edge of the Hudson River where it enters New York Harbor, and this is now Zone A. Evacuation is being advised due to an anticipated storm surge of 6-12 feet due to Hurricane Irene which will arrive early Sunday morning. Evacuation may become mandatory by Saturday, but all mass transportation will be discontinued late Saturday afternoon, so people are being encouraged to leave now and tomorrow. 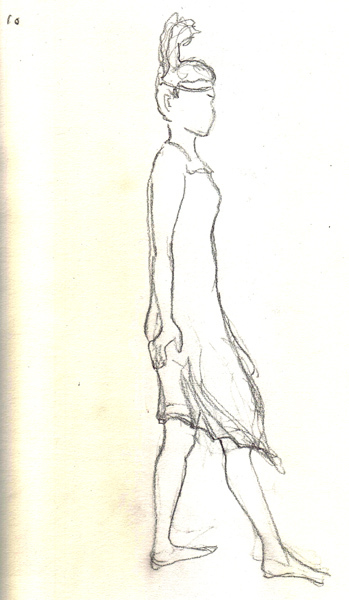 Two 10 minute poses - for which the model put on a dress and attached a feather in her hair. 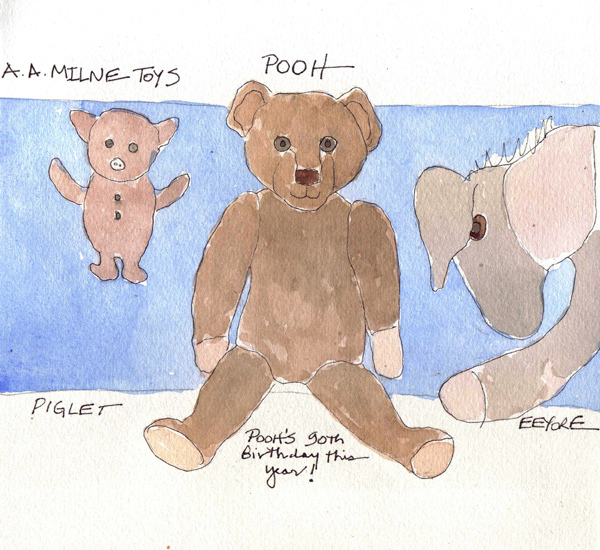 Pooh Bear was given to Christopher Robin Milne on his first birthday in 1921 and the New York Public Library celebrated his 90th birthday this past weekend. 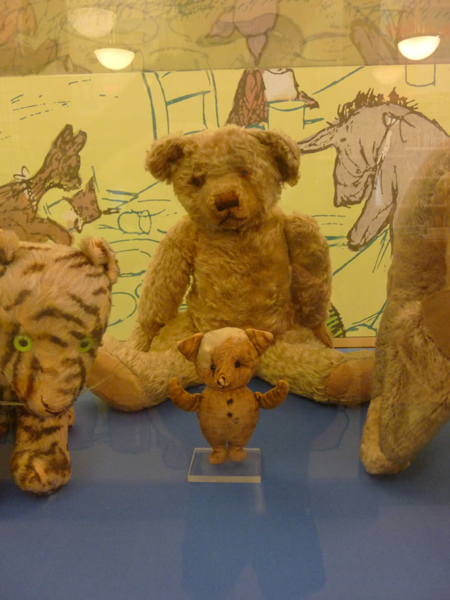 Pooh, a gift from Harrods, was one of 5 of Christopher's stuffed toys that were used by his father A.A. Milne as the inspiration for the characters in his 4 Pooh books. E.H. Shepherd also based his original illustrations on the toys. The toys were given to the American publisher, E.F. Dutton, in 1947. They in turn gave them to the New York Public Library in 1987. This is a picture I took of Pooh Bear and Piglet on my visit Monday. Kanga, Tigger, Piglet, Pooh, and Eeyore live in a glass case in the Children's Library in the main NYPL Library Building on 5th Ave. 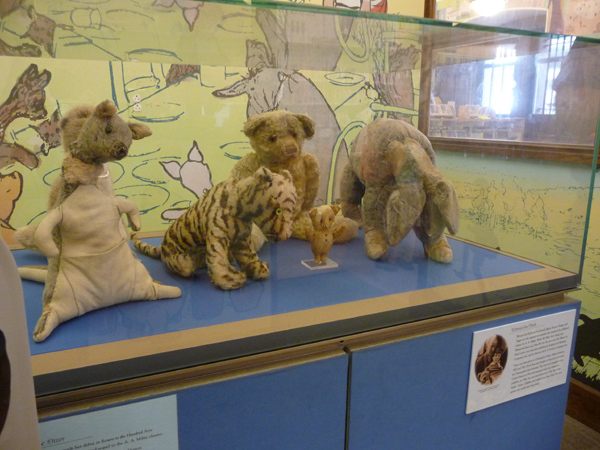 I first saw these toys at the Victoria and Albert Museum in London in 1970 and assumed they "lived" in London. The Milne House is in London - in Chelsea, right off the King's Road. 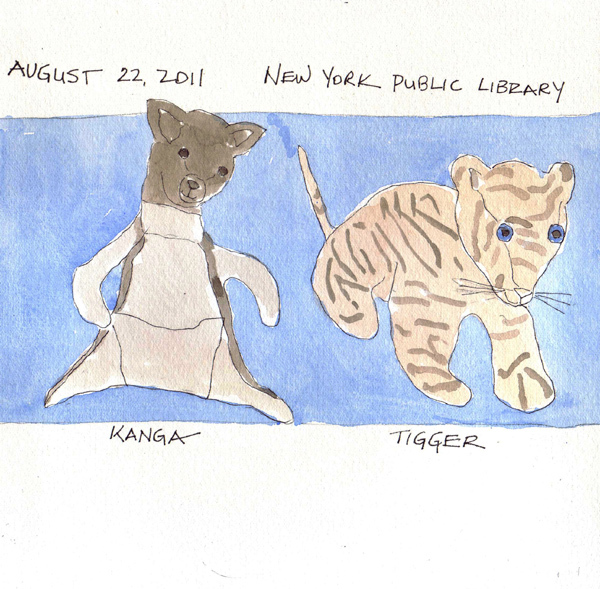 So I was later thrilled to learn that they actually live in NYC and yesterday I went to the Library to sketch them in honor of Pooh's birthday.